Click registration form to enlarge. 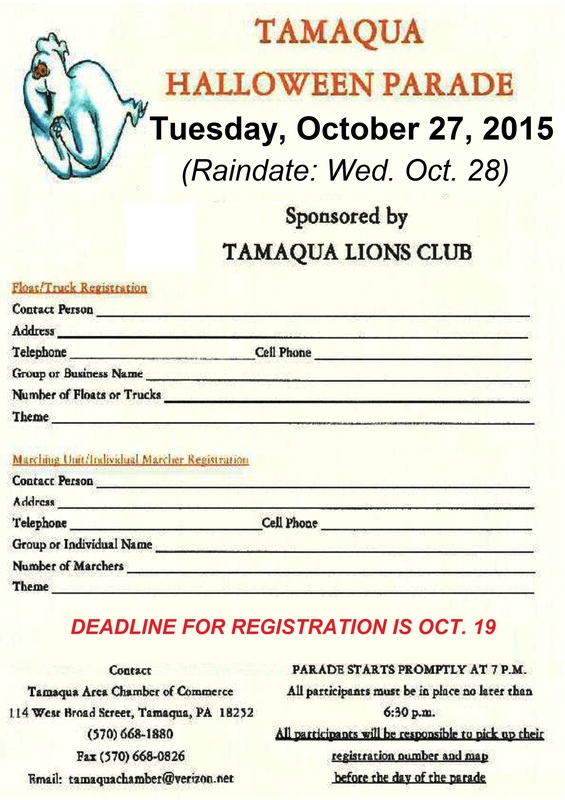 Tomorrow (Monday, October 19, 2015) is the last day to register for Tamaqua’s Halloween Parade. There is no entry fee. The parade, set for Tuesday, October 27, 2015, is organized via the Tamaqua Lions / Lioness Club and Tamaqua Chamber of Commerce. Participants are asked to assemble in the Jamesway parking lot at the east side of the borough. Participants should start arriving at 6 PM but no later than 6:45 PM. The parade will then head west on Broad Street (Route 209) at 7 PM. Rain date is Wednesday, October 28, 2015. All participants are responsible to pickup their registration number and map before the day of the parade. Communications along the parade route will be provided by the Tamaqua Wireless Association. Tamaqua Fire Police will also volunteer their time to assist with traffic control. The judges’ stand will be located outside the chamber of commerce office. Registration forms for the parade are available at the chamber office. Those registering should include a contact person, with addresses and phone numbers. Other information needed includes the number of floats, vehicles and marchers and the theme of each entry. All participants will be contacted in advance of the parade with their position and setup location. A number will be given to each participant or group before the parade. The divisions for the lineup will be announced the week before the parade. Cash prizes will be awarded for the top entries as determined by a panel of judges. There is a $150 prize for Best of Show. Additional prizes will also be presented in two categories: marching units and floats/motorized. The first place prize for each category is $100, with $75 for second place and $50 for third place. For more information on the parade, contact the Tamaqua Area Chamber of Commerce, 114 West Broad Street, at 570-668-1880, via their fax number 570-668-0826 or email at tamaquachamber@verizon.net. Click HERE to find out how to donate towards or sponsor the Tamaqua Halloween Parade.